In recent years there is growing demand for compactness, large capacity, extended cycle life (to eliminate the need for replacement), low internal resistance, fast charging and discharging, and ability to withstand load fluctuations in energy devices used in wearable devices and sensor nodes for wireless sensor networks, both product categories that are expected to achieve widespread popularity moving forward. With this in mind, Murata has developed the UMAC, a small, large-capacity energy device. The UMAC can be used as a small secondary battery in the same manner as a capacitor, but it achieves high-rate charge/discharge characteristics*2 and extended cycle life superior to conventional secondary batteries. 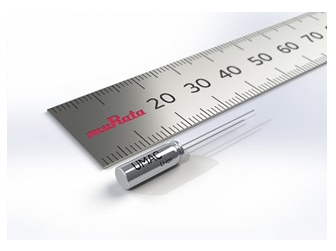 As a power supply for wearable devices or sensor nodes for wireless sensor networks, the UMAC maintains flat voltage characteristics while accommodating a wide range of load characteristics. The highly safe design: Because of its small capacity and the use of chemically stable materials, thermal runaway does not occur. ・ High-rate discharge characteristics mean that peak-assist capacitors are not required. ・ Low self-discharge level minimizes loss of stored energy. ・ Flat voltage characteristics permit use immediately after charging starts for stable device operation. ・ High-rate charge characteristics and long cycle-life characteristics enable repeated use after rapid charging. High-rate discharge characteristics allow for use in a variety of backup scenarios over a wide output range.